People need to be able to search for their saved recipes on my site. In some cases they want to do an OR search: Show me recipes that are either Breads OR Desserts. In some cases they want to do an AND search: Show me recipes that are Thanksgiving AND Desserts. I have looked around and not found a simple way to do this. Something with checkboxes would be nice. However, it seems that checkboxes are typically OR. I.e. you check off all the categories that you are interested in. It does not have to be fancy; either all AND or all OR. My users will not understand boolean searches. This is going to be the simple search, not the advanced one with lots of options and various drop-down boxes etc. OR searches are probably how people understand searches by default* so have that as you default option. This way the user doesn't need to think about it if they just use the default. If the default isn't what they want they are presented with a single concept as an alternative. **Or some other on/off switch. Why not simply serve up results that are tabbed based on OR results and then one for AND? Results are probably much easier to pull than for a user to try and figure out the logic they want. For advanced users you could add these buttons or checkboxes but for most wouldn't giving them tabs All 3 (22), Desserts (500), Breads (112), Thanksgiving (55) be fastest and easiest to understand? The bold text has a dropdown, and the and/or is a default selection that displays both in segregated lists like Mark Sloan said. The implication here is that you should be looking for one or the other, but both are available to you without having to re-start the search if you change your mind. Results that meet the And rule will always also meet the Or rule. You could argue that the And results are more relevant for what the person entered and should appear at the top of the results. If you simply continue with the Or results after the And results the user doesn't even have to think about And / Or. Not the answer you're looking for? 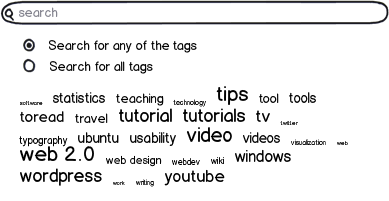 Browse other questions tagged gui-design search checkboxes filter or ask your own question. What's the best way to filter by not-machting results without typing? Best way to let user choose AND/OR logic in search? Please help me figure out this included/excluded search filter interaction (4 options)?